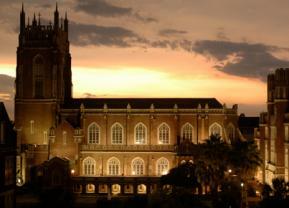 In the fall of 2014, Loyola University New Orleans College of Law will begin to offer law students an opportunity to earn a certificate in Law, Technology, and Entrepreneurship. This new certificate program adds to Loyola’s existing complement of subject matter certificate programs in Taxation, International Law, and Environmental Law and Land Use. The goal of the new certificate program is to help Loyola law students acquire the knowledge and skills they need to become trusted advisers to technology firms or to gain the knowledge and skills needed to become entrepreneurs themselves. The launch of the certificate program was inspired in part by the recent surge in entrepreneurial energy in the New Orleans area. According to the Greater New Orleans Community Data Center, New Orleans has become a hotspot for new entrepreneurs, with 501 out of every 100,000 adults in the New Orleans metro area starting a new business, a startup rate that exceeds even other fast-growing Southern cities such as Houston and Atlanta. New Orleans was also recently named, along with San Antonio, as America’ s No. 1 “brainpower city,” indicating it is one of the metro areas gaining college graduates the fastest. New Orleans Entrepreneurship Week just hosted its sixth annual meeting, featuring 70 New Orleans-based startups and more than 5,000 entrepreneurs, business executives, prominent investors, and student participants. To earn the Certificate in Law, Technology, and Entrepreneurship, students must complete 15 hours of coursework, including five hours of business courses, five hours of courses that focus on technology, and five hours of elective coursework. Students must also maintain at least a 3.0 GPA in the certificate courses and an overall 2.5 GPA or higher. Within the pool of electives, students can choose courses that focus on advising entrepreneur clients or courses focused on training law students who seek to use and understand technology in order to become entrepreneurs themselves. In the advising pool, courses include Securities Regulation, Employment Law, and Real Estate Transactions. In the self-entrepreneurship pool, classes include Patent Law, Copyright Law, Communication Law, and the new Litigation and Technology Clinic. Currently in its second year of operation, the Litigation and Technology Clinic, which is offered through the Stuart H. Smith Law Clinic and Center for Social Justice, is led by College of Law Associate Clinical Professor Judson Mitchell, with assistance from local lawyer and Web developer Ben Veradi. Each fall, students represent clients in real cases and use those experiences as inspiration for tech-law projects to develop in the spring. Last year, students in Mitchell’s clinic developed four legal apps and a search engine for Louisiana laws. Most coursework for the certificate is already part of Loyola’ s College of Law curriculum, but one new course, Law and Technology, will debut next academic year as part of the certificate. Led by Loyola Associate Professor of Law John Blevins, this course will provide students with an overview of relevant modern digital technologies and the legal doctrines most relevant to them. More specifically, students will obtain an overview of both network technologies and software applications that utilize networks. The course will also cover the intersection of these technologies with aspects of intellectual property law, privacy law, cyber law, business law, and communications law. The student interest has been phenomenal, Lovett says. More than 40 students attended the initial launch party for the certificate program, and the enrollment for the first courses to be offered for the certificate in the fall of 2014 required the College of Law to add an additional section of Intellectual Property and double the size of Drury’s Business Planning Seminar. “I only wish I were starting law school at Loyola right now,” Lovett says.